This series of ‘Framed in Steel’ video case studies covers notable recent steel building and bridge projects. Interviews with the participants interspersed with footage of the structure are used to describe the project in general terms encompassing the client’s aims, design drivers and challenges faced during construction. Clients, architects, engineers and contractors give their views on what each project represents for them, what’s important, why steel was used and how steel helped to achieve the client’s objectives. 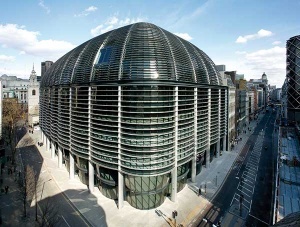 Incorporating some large open trading floors, the Walbrook marks the latest in design development of office buildings for the City of London. 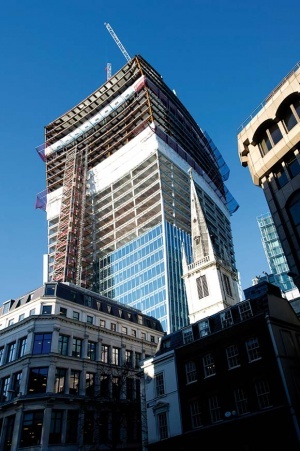 Built on a City of London site directly opposite Cannon Street Station, the 10 storey Walbrook Building is an L shaped structure providing 3,693m2 of retail space and 35,283m2 of office floor space. The project required more than 6,000t of structural steelwork and is located within the height limitation band imposed by the nearby St Paul’s Cathedral. The structure consists of steel columns and beams with composite floor slabs cast in situ on metal decking, with cellular beams used extensively throughout to accommodate services. In order to create the desired open plan column free spaces, the steelwork is based around a 9m grid pattern, with only 10 internal columns on a typical floor plate. Founded in 1863, the Co-operative Group has always had its headquarters in Manchester and is continuing its commercial contribution to city life by constructing a brand new 16-storey headquarters. The building represents the first phase in the redevelopment and regeneration of the Group’s 20-acre site, and will include around 30,000m2 of open plan office space, providing modern working facilities for the Co-op’s staff. 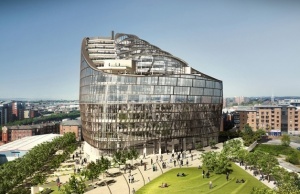 The client wants the project to be a sustainable landmark by becoming the first building in Manchester to achieve a BREEAM ‘Outstanding’ rating and so becoming a benchmark for the commercial sector. Thermal mass and a double façade system are utilised to minimise operational energy requirements. Architecturally, the structure is far from being run-of-the-mill. Its footprint is a triangle with three rounded corners, giving the building a guitar plectrum shape. Each of the corners has a core, two of which rise up to level 11, with the third core extending up to the penultimate level 15. The building’s overall architectural orientation is completed by its sloping upper levels. From the ninth floor the levels step back and are terraced, topping out at the 16th floor core area. The centre of the building is hollow, as a large triangular atrium extends from ground floor all the way up to a sloping roof, a glazed structure that follows the line of the ninth floor to 16th floor terracing. The Peace Bridge in Derry-Londonderry has quickly become a symbol of recent political and cultural changes in Northern Ireland. 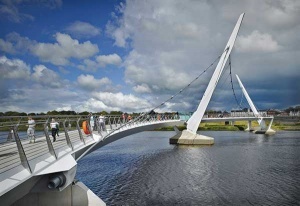 Connecting two historically divided communities on the east and west banks of the River Foyle, it is an aesthetically pleasing expression of the unification of the city. The bridge deck is an orthotropic steel triangular box section, fabricated from painted weathering steel and stiffened both longitudinally and transversely. The width of the deck varies, from 3.5m at the ends to 4.5m at pier locations. An array of hanger rods, comprising of helically spun spiral strands, supports the deck at one edge only. They are spaced along the concave edge at approximately 4.5m centres. Representing a considerable engineering challenge, the NEO Bankside development consists of four concrete framed residential pavilions each featuring a perimeter steel bracing system. The systems serve three key purposes: to provide lateral and overall stability; to reduce the requirement for shear walls allowing greater internal flexibility, and to provide support for the winter garden elements at the prows of the buildings. Stability forces are transferred into the external perimeter bracing via nodes, which are arranged on a six storey interval vertically and on a sequenced interval horizontally. Prefabricated spindle and node fin plate assemblies were delivered to site on 4.5m long steel stanchions that were then embedded within the primary concrete columns. The bracing sections taper at their ends and attach to the node fin plates via cast fork ends, with close tolerance pins of up to 100mm in diameter. The colour of the external perimeter bracing was an important factor affecting the structural design, with implications to the range of thermal stresses and movements to which the system would be subjected. The external diagrid bracing system provides gravity load support to the promontory winter gardens at each end of the pavilions by utilising a system of external hangers or struts at their apexes. The new Siemens facility is situated on a landmark development, known as Teal Park, on the outskirts of Lincoln, and includes a three level 4,500m2 office building, adjacent to a 7,300m2 service workshop. Both are structurally independent steel framed buildings, erected during a nine week programme which completed in March 2012. Structural steelwork was chosen for this project for a number of reasons, such as speed of construction, the long spans required in the workshop and the economy of construction. The three level office building is approximately 100m long by 15m wide, and split into three zones by two braced cores. Steelwork is based around a regimented 7.5m x 6m grid pattern, which will give the offices an open plan feel as there is only one internal column line. The 30m high workshop has a footprint of approximately 100m × 100m. Structurally it is a battened portal frame with four 23m wide spans, each of which will accommodate overhead gantry cranes. Supporting the crane beams are a series of 7.5m high welded double lattice columns, spaced at 9m centres and brought to site as fully assembled members. In order to limit deflections each of the lattice column’s base plates includes a moment connection. Isaac Newton Academy in Ilford, east London, is a £30 million, 1,250-pupil secondary school specialising in maths and music, which opened in September 2012. A key feature of the solution proposed for this tightly constrained site was a double height “sports beam”, projecting 55.8m out of the main building beyond the school’s original site boundaries and over an adjacent car park. This allowed the architects to provide the other school facilities in an interlocking four-storey main block, permeated with outdoor space in the form of courtyards to bring in natural daylight to as many rooms as possible. Structural steelwork was chosen for this project for a number of reasons, such as speed of construction, the long spans required in the “Sports beam” and the economy of construction. 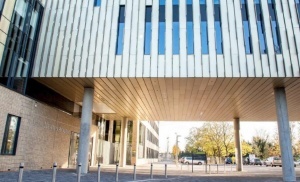 Thermal mass is utilised via exposed precast slabs on the steel frame, and the new building has a super-insulated, high-performance envelope to reduce energy demands. A particularly challenging part of the design was the dynamic loading in the sports hall, where the long span steel beams were designed to minimise floor vibrations. The frame comprises 1,269 tonnes of steel with nearly 2,000 pieces bolted together using simple connections to speed up the erection. 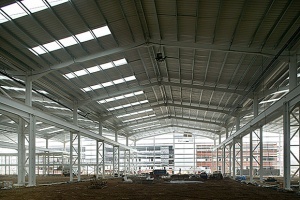 The steelwork is protected with intumescent coating, where needed, to give four hours of fire protection. 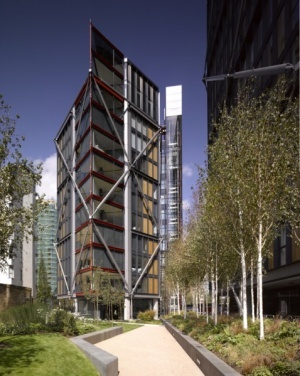 There is a new landmark structure in the City of London. 20 Fenchurch Street (dubbed the Walkie Talkie) enhances a skyline that has altered continuously over the years, as this 38 storey tower has an iconic and unique structural shape. From a relatively narrow base the building gradually flares outwards providing larger floor plates on the upper levels. Each floor has a unique size and the final office level 34 achieves an impressive increase in floorspace of up to 60%. Topping off the structure is a fully enclosed sky garden that includes catering facilities as well as 360 degree views over the capital. The project required more than 8,200t of structural steelwork, which equates to some 4,500 separate sections. The largest steel members to be lifted into place were also the longest beams at 15m and weighing 9t each. A large number of the main floor beams are cellular members, used for their efficiency and service openings. To erect the outer cranked columns, William Hare utilised a bespoke spigot that was welded to the top of each column, which allowed the column above to be placed at the correct angle. The Derby Arena was one of the first Olympics legacy projects to get under way following last year’s Games. The three-storey multi-sports arena will contain a main sports hall the size of 12 badminton courts at ground floor, a 250m national standard indoor cycling track on the first floor and fitness studios and offices on the second floor. Plant and meeting rooms occupy the third floor. The centre of the track is open to the main sports hall below. This layout allows the arena the flexibility to be used as a 5,000-seater concert venue as well as for sports. Designed by architect FaulknerBrowns, the arena building is diamond-shaped with chamfered corners, and features pre-cambered 84 m long trusses at roof level over the main hall area. 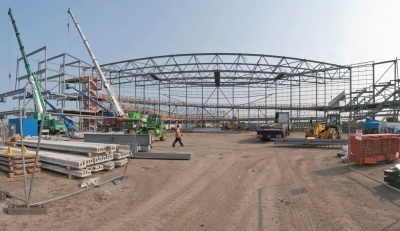 With so much of the building being manufactured offsite – the 700t of steelwork, precast floors, stairs and terracing – the quality of finish will be high, but to keep on programme the contractor has had to keep a strong focus on site progress and timing deliveries correctly. 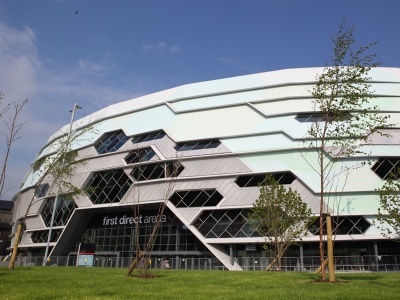 The £60M First Direct Arena is a unique 13,500 capacity music venue built on a constricted site, bounded by residential accommodation and the Leeds Inner Ring Road. It is the most sustainable arena in the UK and a striking landmark structure that combines innovative features to optimise audience experience with extreme restrictions on noise breakout to minimise any impact on neighbouring residents. Creating the arena’s large clear spans demanded a steel solution and a total of 13 trusses spanning up to 72m were installed. Innovation and collaboration between project team members enabled an increase in truss depth to minimise weight whilst still maintaining the same overall depth of the roof zone.